I’m not normally one for alliterative titles, but it fit here. Often when I absorb media — read a book, watch a movie, listen to music, and so on — I find or look for things I can take away from it. Whether it’s ideas for role playing games or ways to improve my programming ability, new techniques or traps to avoid, I like to incorporate new things into what I know and do. A major component of my day job is to prepare technical documentation. I’m not formally a technical writer, I’m a software developer, but I do a lot of technical writing. This lends itself to a certain mindset — informationally-dense, but generally focusing on factual information rather than narrative elements. There isn’t often a story to be told in a database dictionary, operations manual, or functional specification. 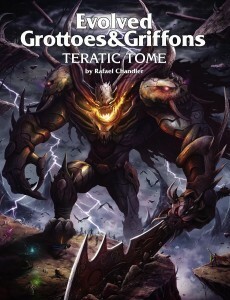 Teratic Tome demonstrated to me that I am horribly underusing monsters. I do not mean that I’m not using enough of them. I mean I am not taking full advantage of them. As I said in my review the other day, the monsters of Teratic Tome tend to be monstrous. Even more than their raw mechanics would suggest, they are disturbing in their actions and behavior. I have a habit of not making use of such elements, and I also have a habit of not foreshadowing well or giving hints of what is to come. When I design I like to figure out my narrative needs first, which is why my Entity Definition Template is as it is — focused almost entirely on the narrative components, with the mechanics almost an afterthought. After I understand my narrative needs I look for mechanical elements that will fit, only building something new if I need to. As a professional software developer, this makes sense to me. As a game developer, once I get to mechanics time, I tend to overlook the narrative components. If I were to design a monster book last week, I think the monsters would be structurally sound and mechanically balanced, and frankly pretty boring. Usable, but not inspiring. I feel the same way about many monster books I have read. The first thing you see after the name is typically a combat stat block. This may be followed by a brief physical description and some more fluff . This varies between editions; D&D 3.x tends to have combat stat block, brief description, details of combat abilities, then any additional points of interest such as society or how to use the monster as a character race. The often don’t strike me as particularly evocative. This is a place Teratic Tome shines. The various monsters are individually quite distinct, well beyond their mechanics. In fact, I would estimate — without verifying in the book — that roughly equal column space is spent on the mechanics and narrative components. If anything, I would guess they are more heavily weighted toward the narrative components. More sensory information. Describe not just the shape and color of the monster, but try to include at least three senses (sight, sound, smell, touch, even taste) and how it feels to be in the creature’s presence. My Entity Definition Template has several descriptive elements, including various ‘signature’ information, but I need to make a point of considering all the senses, even the less concrete ones. Bury hints and stories of creatures ahead of time, or even just apply their signatures ahead of time. Rafael describes several monsters capable of depopulating a village, how they go about it, and what evidence they leave behind (what I consider ‘signature’ information). Don’t wait until I plan to use the monsters to apply this, have the PCs find a village surrounded by a burned-out barricade and everyone, or nearly everyone, dead… and any survivors driven mad by what they experienced. Have lesser threats leave spoor, or negative evidence such as livestock missing (or half-eaten) or those foolish enough to travel alone never seen again. Remember that more powerful monsters should not only be more dangerous when encountered, but should likely have far-reaching effect — and remember that this may be ‘more powerful in the aggregate’ rather than more powerful individually. A lone, weak goblin likely has only limited effect on his world, a goblin tribe might terrify a barony (or the farmers in it), but a dragon might worry a kingdom. It seems likely to me that the truly great monsters will not be seen often, but stories will abound (possibly told in hushed tones) of each time they have appeared because when they walk, the world shakes. For some, especially the very powerful, consider omens. Signatures to date have focused on the signs that a particular entity has been present, omens describe signs that a particular entity is coming. Identify goals or purposes of the various creatures. Some might be simply trying to survive, some might have grand ambitions, some might be driven by madness to destroy everything they can. Mechanics make a monster playable. These other elements will make it memorable… which is what this is all about. I appreciate the irony that I forgot what makes monsters memorable. I am thinking about preparing a monster book — even if it’s just a selection from the Pathfinder Reference Document — to expand on the mechanical elements present and build up these narrative elements. Goblins are also quite superstitious, and treat magic with a fawning mixture of awe and fear. They have the habit of ascribing magic to the mundane as well, with fire and writing both taking on mystical power in goblin society. Fire is much loved by goblins for its capacity to wreak great destruction and because it doesn’t require size or strength to wield, but written words are hated. Goblins believe that writing steals words out of your head, and as a result of this belief, goblins are universally illiterate. Goblins are voracious and can eat their body weight in food daily without growing fat. Goblin lairs always have numerous storerooms and larders. While they prefer human and gnome flesh, a goblin won’t turn down any food—except, perhaps, vegetables. This makes some sense for a generic supplement, even though Pathfinder can be considered to have Golarion as the assumed default setting. What if we expanded on them to make them more distinct? Jhesiri are a race of small-bodied, long-limbed scavengers and opportunists. They are pale-skinned, but you would be hard-pressed to tell under the encrusted dirt. They rarely build new structures, preferring more easily-inhabited locations such as caves, thickets, and ruins. They favor encampments near coastlines on trade routes and near poorly-defended settlements for their ability to salvage lost goods and to raid for food and other items. With their diet and poor hygiene they tend to have a distinctly sour, musky odor to them, and often cackle madly as they drop on their targets from ambush. When raiding a settlement they will focus on easy pickings — unattended belongings, stray animals, and children. If the settlement can be weakened enough for a raid to be viable they will do so, but if not they might either retreat until the settlement is lulled to complacency again, or maintain a low-effort campaign to exhaust the defenders before raiding. Jhesiri encampments are untidy at best, filthy more often. They are highly nomadic, moving on when the raiding possibilities become cost-ineffective or their encampments become too disgusting — which is a difficult thing. If this means depopulating a village for travelling rations, or for a new place to sleep, is much the same to them. They are primarily interested in personal survival above all, with little loyalty within their tribe beyond the awareness of their vulnerability if outnumbered (each will happily kill individuals within the tribe if there is sufficient personal benefit to it, but are unlikely to act against the survival of the tribe… again, unless they see enough in it for them). They tolerate each other out of pragmatism, not altruism or amicability, but would prefer to stick with their own kind against all others because they hate them even more. On the other hand, if an outsider would be more personally useful than the tribe, well…. Jhesiri try not to kill wastefully, which is to say that they want to eat everything they kill if it can be arranged. They can eat their own body weight each day without becoming fat, and can go without food for days before becoming weak. A little rough yet. This is off the top of my head and I’m distracted (Joe Hisaishi’s Studio Ghibli 25 Years Concert is on and absorbing some of my attention). I am not going to do so here and now, but I am inclined to add a few more elements. A sample encampment, perhaps, or a raiding party. Maybe a village suffering Jhesiri depredation. Describe the region they live in — not just the characteristics, as above, but actual named places… including some that are, after a fashion, no longer there. Stories told of Jhesiri raids and what ‘everyone knows’ about Jhesiri. And I reserve the right to be… not entirely accurate, let us say, in some of these descriptive elements. I’m trying to remember the last time I read anything like a monster manual that actually inspired me. I usually just have a plot in mind, and if I don’t already have monsters that designed for the adventure then I skim through and grab something that fits the bill. I know exactly what you mean. I used to love monster books because it was all new, but over time it became kind of old hat. I’d read them so I was somewhat familiar with the contents, then let them sit until I needed something, at which point I’d dig until I found it. Or I’d be bored and flip through until I found a picture of what I wanted, then decide whether or not to use it. They were a repository of miscellaneous bits to work with, but rarely did I see anything that really grabbed me. “Dude, that just ripped your face off! Have a potion of cure serious wounds!” doesn’t have nearly the same impact as finally tracking down the creature that has been terrorizing the town for months and leaving faceless corpses every few days… and having to walk through it’s grisly mausoleum of — literally — death masks, neatly arranged, in order to meet it. The monster descriptions are such that they really deserve more consideration than “CR 7 brute looks about right, I’ll use this”. Keith, Thanks for a great column! You’ve inspired me in return. Pingback: Neoplastic Press or Nerd-Crush, You Decide | Keith Davies — In My Campaign - Keith's thoughts on RPG design and play. Pingback: Teratic Monster Design | Keith Davies — In My Campaign - Keith's thoughts on RPG design and play. Pingback: Teratic Themes | Keith Davies — In My Campaign - Keith's thoughts on RPG design and play. Pingback: Teratic Exploration | Keith Davies — In My Campaign - Keith's thoughts on RPG design and play. Pingback: Polyhedral Pantheon: Goblin Pantheon, The Crunchy Part | Keith Davies — In My Campaign - Keith's thoughts on RPG design and play.